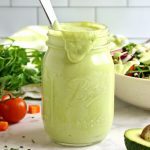 This Healthy Creamy Avocado Ranch Salad Dressing is the perfect alternative to store-bought ranch dressing! It's full of healthy fats, lean protein and packed with delicious ranch flavour! And it's easy to make! Add the flesh of the avocados to your blender, along with the yogurt, mayonnaise, lemon juice, dijon mustard, garlic, scallions, basil, chives and salt and pepper. Blend on high speed until very smooth. If the dressing appears too thick (this will depend on the consistency of the yogurt and the avocados), add a tablespoon of water to the blender and blend again until smooth. Add water one tablespoon at a time until the right consistency is reached. Pour into a mason jar or other airtight container and chill in the fridge for about one hour before serving. Serve over your favourite garden salad, or use as a dip for fresh veggies! This dressing keeps in the fridge for about 5 days in an airtight container, so feel free to make it a day or two ahead of time.